Who’s in charge of the REAL-ID database? | Papers, Please! Who’s in charge of the REAL-ID database? – Papers, Please! 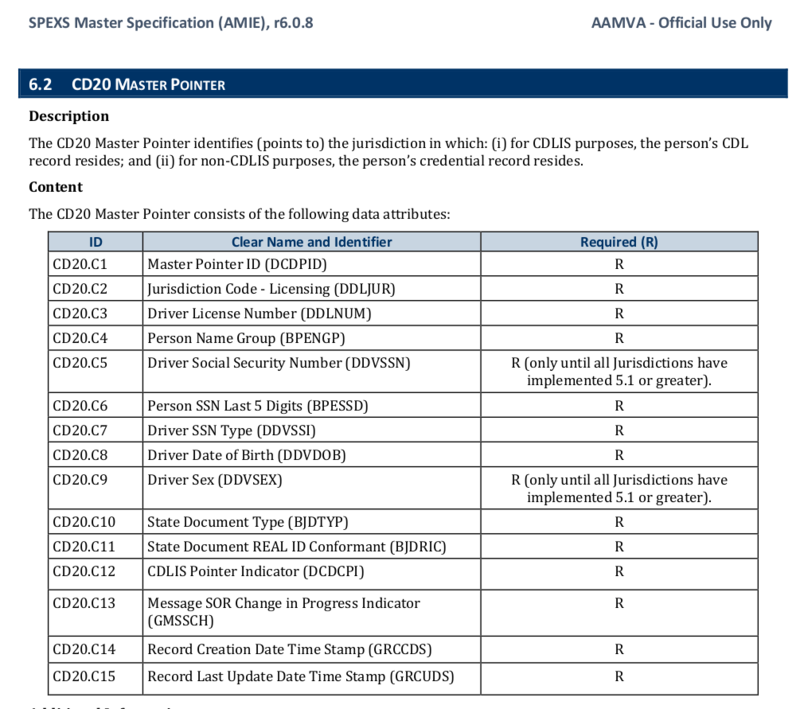 Members of the legislative committees that oversee the Alaska DMV hadn’t known about the batch upload of Alaskans’ personal information, and weren’t pleased. SPEXS pointer records include the last five digits of each person’s Social Security number, and for many years all Social Security numbers issued in Alaska had the same first three digits. That leaves only one of the nine digits of a social security number for an identity thief or other attacker who got access to SPEXS to guess or determine by trial and error. Officials of the DMV and the Department of Administration repeated these claims about their active participation in the S2S governance body during legislative hearings. They assured legislators that the state of Alaska was trying hard to get the governance body to reduce the number of digits of each Social Security number included in SPEXS. To learn more about SPEXS, how it is managed, how much oversight states really exercise over AAMVA and AAMVa’s subcontractor, Clerus Solutions, and what happened to Alaska’s request for changes in SPEXS record content, we made a request in April 2017 under Alaska’s public records law for email messages between the state, AAMVA, and Clerus Solutions. Despite the deadlines in Alaska state law for disclosing requested records, Alaska officials are still dragging their feet more than a year later, and have produced none of the records we requested. They have found thousands of relevant email messages, but have told us it will take “many months” more to review them and decide which, if any, to release. We’re still waiting, but in the meantime we made a second, narrower request for the latest version of the SPEXS specifications and for any agendas, minutes, notes, or other records of the meetings of the S2S/SPEXS governance body that Alaska is part of. The DMV has such records, but conducted a grossly incompetent or otherwise grossly inadequate search for them in response to our request. The DMV had such records, but destroyed them all (illegally) to evade having to disclose them to us in response to our request. The DMV has such records and knows where to find them, but is lying to us and illegally withholding the requested records. Is this another example OF NGO GOVERNANCE of political policy? Globally Controlled, but Locally Run.